The H&K Group is a family of companies providing heavy civil construction and construction materials to the Mid-Atlantic Region. 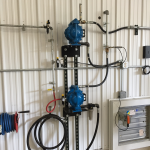 H&K used Haldeman Equipment to upgrade the oil systems at multiple locations including Reading Site Contractors, Locust Ridge Quarry, Blooming Glenn Quarry and their Skippack Headquarters. 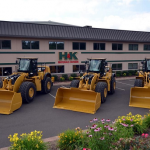 Haldeman also outfitted H&K’s newest shop at Landis C. Deck Site Contractors. The Landis installation includes a 2000 gallon waste oil storage tank with automatic transfer to the waste oil furnace. 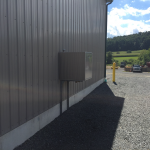 To help H&K collect as much used oil as possible prior to winter, Haldeman installed a temporary 1,000 gallon used oil tank while the 2,000 gallon tank was being built. When the permanent tank arrived on site, Haldeman transferred oil from the temporary tank to the 2,000 gallon tank as part of the installation. 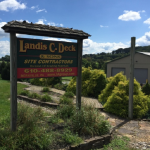 Using a the temporary tank allowed Landis Deck to collect an extra 800 gallons of heating oil..
A popular feature with heavy equipment companies and rental companies is a hose reel cabinet on the exterior of the building. This allows equipment already loaded on a trailer to be “topped up” as it heads to a job. 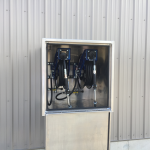 Landis Deck put two 50′ hose reels outside in a weatherproof cabinet for dispensing engine oil and hydraulic fluid. The bay doors stay closed in winter and work in the shop is no longer interupted whenever a piece of equipment needs a top-up!